Look for a deep red-black color, aromas of spice and chocolate and a luxurious texture. This wine is seductive and immediately appealing and we encourage enjoying it now but also know that it has great ageing potential. Our 2007 Cabernet Sauvignon has a deep red-black color, with bright fruit forward aromas, a hint of spice and a touch of chocolate. On the palate, the wine is full bodied, concentrated, with a smooth richness that lingers. The bright fruit aromatics are persistent on the pallet, with balanced acidity and a hint of sweetness from the new French Oak. 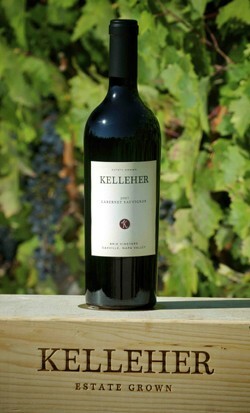 The well-structured yet smooth tannins are present throughout the lingering finish. Production is 267 cases. Production Notes Fermentation: The grapes were handpicked at full maturity, when the tannins were fully developed. The fruit was hand-sorted both in the vineyard and at the winery. The grapes were cold-soaked in stainless steel tanks and then fermented with wild yeasts. During fermentation, the tanks were pumped over twice per day until dry. Once fermentation was complete, the wine was warmed up to 100 degrees and pumped over once per day for five days, then the tank was drained over night. The wine was aged for 24 months in half new French oak barrels and half once-filled French oak. The wine was lightly fined with 1 egg white per barrel. Perfect wine... tried it @ Brix and it was fantastic!